http://www.jhunjhunu.rajasthan.gov.in. Jhunjhunu district application submission last date is on or before 20-11-2017. There are total 41 vacancies are going to fill through District Collector Office Jhunjhunu recruitment 2017. Candidate must have age limit between 18 years to 35 years as on 01-January-2017. Selection of candidates applying for Jhunjhunu District Recruitment is based on their merit performance in academic qualifications. Pay scale offered for the post Jr. Technical Assistant is Rs. 13,000/- and for the post Accounts Assistant is Rs. 8000/-. 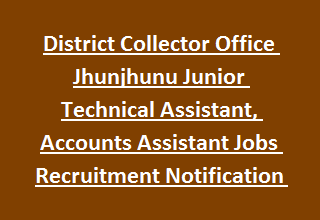 See the Jhunjhunu District Notification for Qualification related details, Application Procedure, Age limit, Scale of Pay, Selection method of District Collector Office Jhunjhunu Recruitment of 41 Accounts Assistant, Junior Technical Assistant Jobs Recruitment 2017. Available vacancies in District Collector Office Jhunjhunu Recruitment are 41 posts. Junior Technical Assistant: B.E/ B.Tech in Agricultural Engineering or Diploma/ Degree in Civil Engineering from any recognized university/Institution. Accounts Assistant: Must have to qualify B.Com/ CA Intermediate/ ICWA (Inter)/ Company Secretary (Inter) from recognized University/ Institution. See the Jhunjhunu District notification for other qualifications. Pay Scale for the post of Junior Technical Assistant is Rs. 13,000/- per month. Pay Scale for the post of Accounts Assistant is Rs. 8000/- per month. Candidate age for all post in Jhunjhunu District Recruitment should be below 35 years & above 18 years as on 01-01-2017. For Age relaxation details, see the Notification. Selection of candidate applying for Jhunjhunu District Recruitment Jobs will be based on their merit performance in academic qualification. Please go through the Jhunjhunu District notification for Selection process details. Interested/ Eligible candidates have visit the Jhunjhunu District website http://www.jhunjhunu.rajasthan.gov.in. Go through the district website and read the guidelines for filling application. Submit the application with respective documents/ Certificates mentioned in the notification before 20-11-2017. District Program Coordinator &Chief Executive Officer, Zila Parishad, Jhunjhunu.